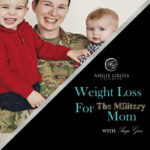 Welcome to the 6th episode Weight Loss For The Military Moms Podcast. In this episode I talk about my realization with not feeling my feelings like I should be. I never realized it until I discovered this new awareness. How this one thing has been holding me back from everything and it’s the one thing that my fellow Military Mommas could totally relate to!